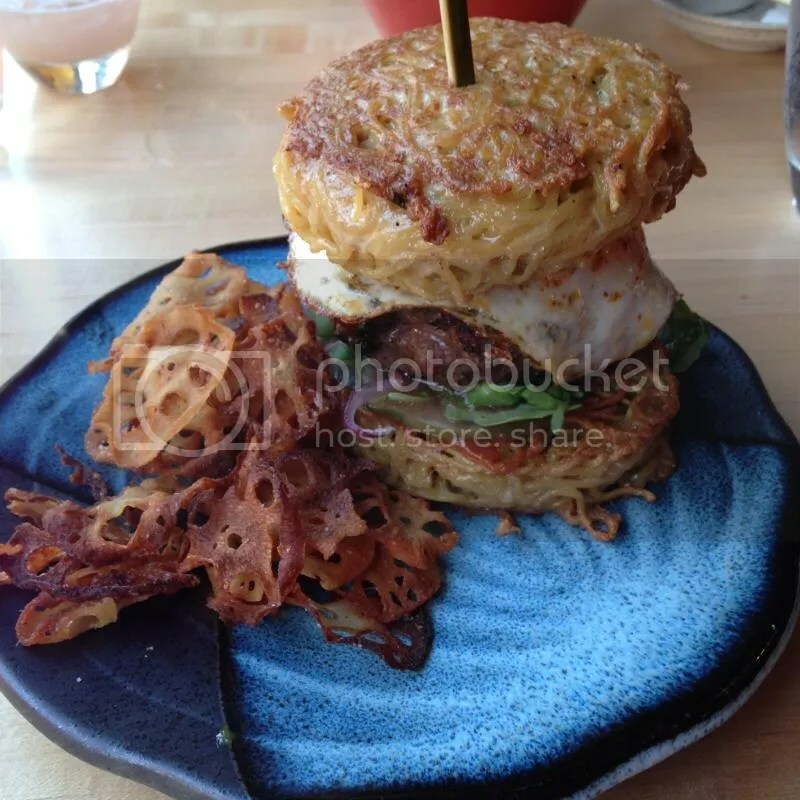 It’s been a year since the ramen burger craze first swept the nation and by sheer coincidence, here I am, writing about a ramen burger again this week. This time from CoZara, a newly opened Izakaya (Japanese Pub) in University City. I was really excited to check out their version since announcing “Ramen Sundays” a few weeks ago, where their ramen burger – topped with spicy mayo, ginger ketchup, Gruyere cheese, red onion, tomato, arugula & a fried egg – is featured from 2-8 PM (it’s not offered on their regular menu). So I ordered my burger and I waited. My boyfriend ordered a bowl of pork belly ramen, which came out, cooled and he finished eating it before my food even hit the table. I was worried that there was some kind of miscommunication with the order since 1) the waitress put the bowl of ramen in the middle of the table thinking we were splitting it and 2) neither our server/bartender or the waitress made any mention of their being a delay with my food either when they brought the ramen, took the ramen away, or refilled my water glass after another five minutes of waiting. I understand that putting together ramen buns may have taken a while to prepare, but any indication of that from the staff either when I ordered or when food/drinks were brought to the table would have put me a little more at ease. But finally, just as I was about to call it a day, my burger arrived! Served with a side of fried lotus chips, this thing was a beast. Posted in CoZara, izakaya, japan, japanese, japanese food, ramen, Ramen Burger, University City. Bookmark the permalink. On one of my adventures in Japan, I found myself in the city of Hiroshima. While most famous for being the site of one of the WWII atomic bomb droppings, it is also famous for a unique Japanese dish known as okonomiyaki: Okonomi meaning “What you like” and Yaki meaning “grilled”, it’s essentially a grilled pancake with a bunch of different items of your choosing such as noodles, bacon and cabbage. It’s then topped with a sweet brown okonomiyaki sauce, sprinkled with seaweed and bonito flakes, and drizzled with Japanese mayonnaise. 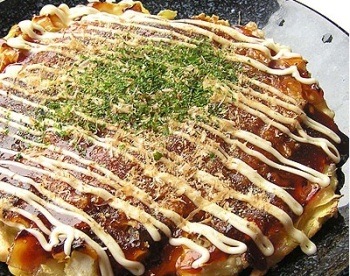 Hiroshima style okonomiyaki differs from what others think of as the “authentic” Osaka style okonomiyaki by having its ingredients layered, rather than mixed together. Downtown Hiroshima is home to a six-story building known as Okonomimura, which is home to 28 different Okonomiyaki restaurants. Each floor has about 8 stalls, which are comprised of diner bar stool seating with counter service set around a giant griddle. Seven lil Okonomiyakis – All in a row. If you look closely, they start by spreading a thin layer of batter on the griddle, which cooks and becomes the base of the “pancake”. It’s then piled high with a ton of seasoned cabbage. You can have it your way, just like Burger King! Choose between Udon or Soba noodles, fried egg, add shrimp, etc – whatever’s on the menu. Posted in hiroshima, japan, japanese food, okonomiyaki. Bookmark the permalink.